NEW DELHI, Apr 25 2018 (IPS) - A devastating fire in a shanty at Kalindi Kunj, a New Delhi suburb, that gutted the homes of 226 Rohingya refugees from Myanmar, including 100 women and 50 children, has trained a spotlight on India’s ad hoc policy on international migrants. Already persecuted in their country of origin, Rohingyas — the largest stateless population in the world at three million — have found shelter across vast swathes of Asia including in India, Pakistan, Bangladesh, Thailand and Malaysia. According to the International Organization for Migration (IOM), there are more than 700,000 Rohingya refugees in Bangladesh alone, who now face the onset of the monsoon season in flimsy shelters. Demographers note that the Rohingyas’ displacement, while on a particularly dramatic scale, is illustrative of a larger global trend. According to the United Nations High Commissioner for Refugees, the world is witnessing the highest level of displacement on record with 22.5 million refugees, over half of them under 18, languishing in different parts of the world in search of a normal life. Often referred to as the boat people – because they journey in packed boats to escape their homeland — around 40,000 Rohingyas have trickled into India over the past three years to cities like New Delhi, Jaipur, Hyderabad and Jammu where their population is the largest. 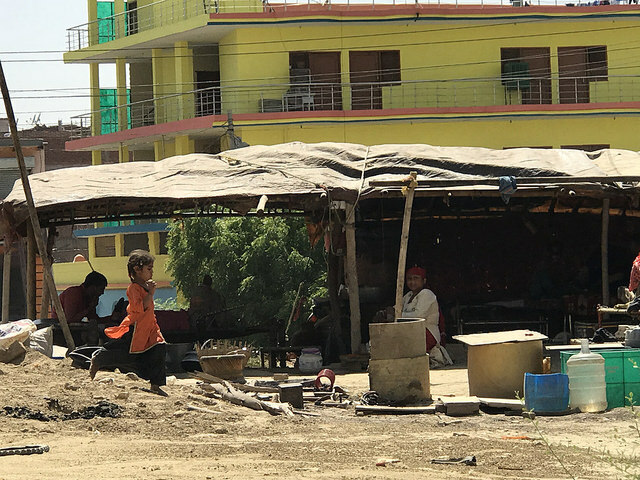 Some had settled in the Kalindi Kunj camp that was set up in 2012 by a non-profit on a 150-odd square metre plot that it owns. The camp’s occupants worked as daily wage labourers or were employed with private companies. A few even ran kirana (grocery) kiosks near the camp. Most of these refugees had landed in Delhi after failed stints in Rohingya camps in Bangladesh or Jammu (a northern Indian city), where they were repeatedly targeted by radical Hindu groups. 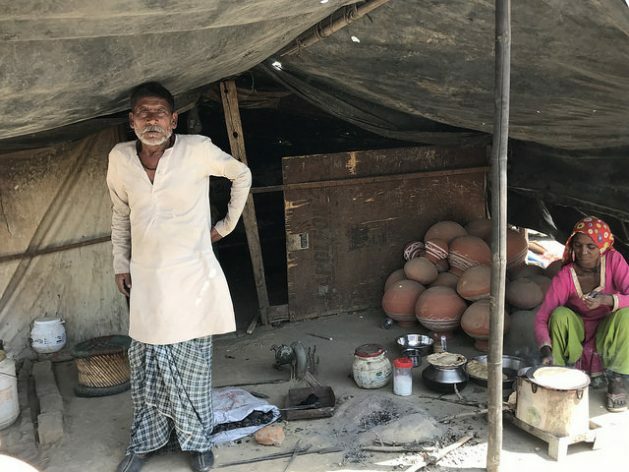 Nurudddin, 56, who lost all his belongings and papers in the Kalindi Kunj fire, told IPS that he has been living like a vagabond since he fled Myanmar with his wife and four children in 2016. “We left Myanmar to go to Bangladesh but we faced a lot of hardships there too. I couldn’t get a job, there was no proper food or accommodation. We arrived in Delhi last year with a lot of hope but so far things haven’t been going too well here either,” said the frail man with a grey beard. Following the Kalindi Kunj fire, and public complaints about the government’s neglect of Rohingya camps, the Supreme Court intervened. On April 9, the apex court asked the Centre to file a comprehensive status report in four weeks on the civic amenities at two Rohingya camps in Delhi and Haryana, following allegations that basic facilities like drinking water and toilets were missing from these settlements. Senior Supreme Court lawyer, Prashant Bhushan, appearing for the Rohingyas told the court that the refugees were being subjected to discrimination with regard to basic amenities. However, this was refuted by Additional Solicitor General, Tushar Mehta who, appearing for the Centre said there was no discrimination against the Rohingyas. The court will again take up the matter on May 9. The Rohingya issue entered mainstream public discourse last August when the ruling Hindu nationalist Bhartiya Janata Party government abruptly asked the country’s 29 states to identify illegal immigrants for deportation – including, the guidance said, Rohingya Muslims who had fled Myanmar. In its affidavit filed before the Supreme Court, the Centre claimed that Rohingya refugees posed a “serious national security threat” and that their deportation was in the “larger interest” of the country. It also asked the court to “decline its interference” in the matter. Some critics also pointed out that the Rohingyas were being targeted by the ruling Hindu Bhartiya Janata Party government because they were Muslims, an allegation the Centre has refuted. Parallels have also been drawn with refugees from other countries like Nepal, Bangladesh and Pakistan who have comfortably made India their home over the years. However, to keep a strict vigil against the Rohingyas’ influx, the Indian government has specially stationed 6,000 soldiers on the India-Bangladesh border. Activists say that despite thousands of refugees and asylum seekers (204,600 in 2011 as per the Central government) already living in India, refugees’ rights are a grey area. An overarching feeling is that refugees pose a security threat and create demographic imbalances. A domestic legal framework to extend basic rights to refugees is also missing. Since the government’s crackdown, Rohingya groups have been lobbying to thwart their deportation to their native land. In a Public Interest Litigation in the Supreme Court of India titled Mohammed Salimullah vs Union of India (Writ Petition no. 793 of 2017), they have demanded that they be allowed to stay on in India. However, the government has contented that the plea of the petitioner is untenable, on grounds that India is not a signatory to the UN Convention of 1951. The convention relates to the status of refugees, and the Protocol of 1967, under the principle of non-refoulement. This principle states that refugees will not be deported to a country where they face threat of persecution. The matter is now in the Supreme Court of India which is saddled with the onerous task of balancing national security with the human rights of the refugees. However, as Shubha Goswami, a senior advocate with the High Court points out, while India may not have signed the refugee convention, it is still co-signatory to many other important international conventions like the Universal Declaration of Human Rights, which includes the principle of non-refoulement, and it is legally binding that India provide for the Rohingyas. There’s growing public opinion as well that the government should embrace and empower these hapless people.